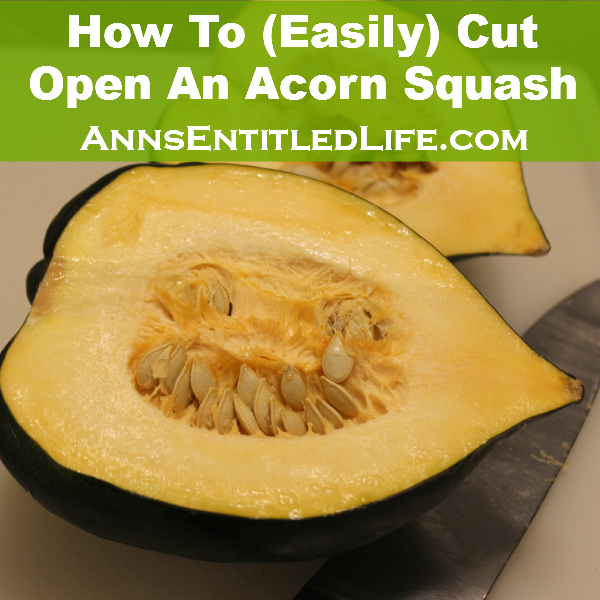 How To (Easily) Cut Open An Acorn Squash; A simple, ingenious way to easily cut open your acorn squash without using upper body strength! Perfect every time. I am sure there are many ways to cut open a squash, but hubby figured out this ingenious way for me to do it that does not require a lot of upper body strength – something I have never had in spades. You will need a cutting board, a large non-serrated knife and a rubber mallet. We have a dedicated rubber mallet just for food, and we keep in one of our kitchen drawers. 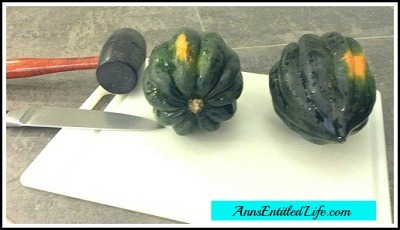 Place the knife into one of the dents in the middle of the acorn squash, and push a little bit to get started. 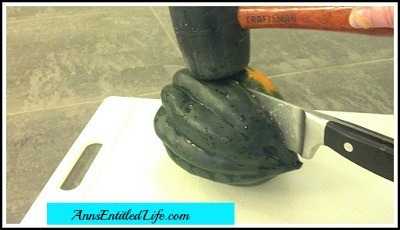 When you can’t easily apply more pressure, get out your mallet and give the top if the knife blade a whack. When the blade is in the squash far enough that you can’t hit it any more, hit the exposed handle. The knife will easily cut through the rest of the squash. If you are working with a butternut squash that doesn’t have dents, eyeball the middle of the squash and inert the tip of the knife into the squash, applying pressure downward and back on your knife. This will insert the knife in a straight line down the length of the squash. The only difference between a squash with the indentations and without, is you don’t have a natural guide. The pressure is the same. This will cleave cleanly. Scoop out the seeds and discard (or save to roast). When you cook your squash there are no “right” ingredients. Some people cook them without any sugar or butter (those people are odd ducks in my opinion), many people, myself included, like a sweet topping. Basically you can use anything sweet from sugar to honey to maple syrup. If you use maple syrup or honey, you really don’t need to add butter but you can – it is all to taste. For myself, I love to load up my acorn squash. This is two pats of butter (which will be overkill for most people, one is plenty) and a heaping tablespoon of brown sugar. The problem with this is it is too much liquid on the cooked acorn for most people when the squash is cooked, and you can burn yourself if you try and eat the finished product too quickly. Me? I like to live on the edge. 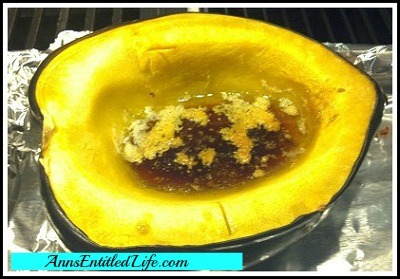 Cook your acorn squash on a foil lined pan for easy clean-up. The temperature is 350º, and I bake for 45 minutes. 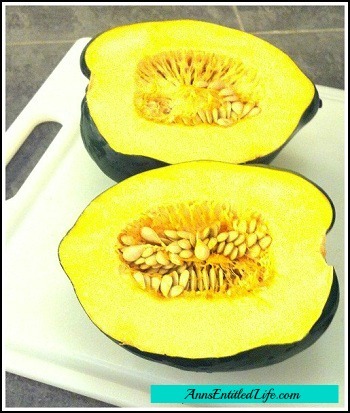 If you want the sugar to seep into your squash, give the vegetable a slash or two before cooking. Not too deep though as you don’t want your sweet liquid to run all over you pan, you want it cooked into your squash! How do you cook your squash? Sweet, straight up or some other way? This recipe originally appeared on Coupons, Deals and More many moons ago! I recovered a lot of lost recipes from my old blog, and this is one of them. It has to be sweet! OMGoodness! Why have I never thought to use a mallet?!? I always have a hard time cutting those things open. Thank you! I never thought if it either, Stephanie. It was all Hubby’s idea, and even I – without any arm strength – can now do it easily and cleanly. I just stick my big heavy knife into the side somewhere and then pull down as far as the knife will go, adjust the squash and continue around.. I guess I have plenty upper arm strength. 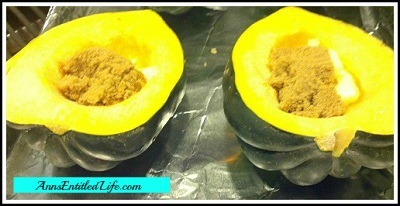 I like my acorn squash all kinds of ways… I never met a squash or a squash recipe that I didnt love.. If I could only have one family of vegetable for the rest of my life.. it’d be the squash family.. I poke the squash a bunch of times with the tip of a knife, just past where the skin meets the flesh is good. Then I microwave the whole thing for 5 to 10 minutes, depending on the size. Let it set for a few minutes to cool. Then it is REALLY easy to get a knife all the way through! I do the same with acorn and butternut squash.